« Crimson Romance Blog Hop! It’s here! It’s here!! The craziest shopping day of the year! If you’re like me, then you’re at home, comfy and cozy in your jammies, chillin’ on the couch with a coffee and shopping online. I almost never brave the stores on Black Friday. I just can’t bring myself to get up super early on a day when I can sleep in and go out in the cold to shop with hordes of deal-hunting shoppers. So I’m here to make your holiday shopping a little easier. Hop with us TODAY ONLY and you can enter to win all kinds of prizes! Maybe you’ll get some of holiday shopping done while having fun! Leave a comment with your email address and you’ll be entered in to win the grand prizes! Be sure to hop around to all of the other participating author’s websites by clicking HERE or on the blog hop icon above! But that’s not all you could win! I’m also doing my own giveaway here on my blog! I’m giving away a $20 Amazon or B&N gift card that you can use towards your holiday shopping! Who doesn’t love free money?! All you have to do to win is enter via my rafflecopter! The more you do, the more chances you earn to win! Have a few readers in your family to buy gifts for? Check out my books, available in both digital and paperback! Buying my books as gifts today will earn you extra entries into the $20 gift card giveaway! Newly single Cassidy Quinn is thrilled to be a contestant on the new reality dating show The One. But her excitement turns to horror when the gorgeous bachelor turns out to be her ex-boyfriend. Seeing Brad again makes Cassidy realize she might not be as “over him” as she thought—and then she meets hunky cameraman Evan Burke. Not sure yet? How about an excerpt from the book? Evan shifted beneath her and in one quick movement she was on her back as he hovered over her. Every part of her body flared to life when he brushed her hair back from her shoulder and left a trail of soft kisses from her collarbone to her belly button. Oh my God, he’s like the Energizer Bunny. “You didn’t seem tortured,” she said, breathless. Cassidy held her breath as he kissed her with more affection than she expected. Passion burned in his kiss, but an undertone of something else was present now too— something that lingered in the pit of her stomach even after he pulled away. She forced her eyes to focus on him, not wanting to get carried away in the moment again before they’d had a chance to talk. She didn’t know anything about Evan. This wasn’t typical Cassidy behavior, but that’s why she’d come here in the first place—to do something unlike her normal life. She hadn’t realized that would include doing someone, too. “Are you related to Bond, James Bond?” She couldn’t help but smile. 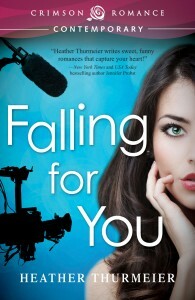 Ready to buy your copy or give FALLING FOR YOU as a gift? Click on the links below! 1. LEAVE A REVIEW OF ANY OF MY BOOKS AT AMAZON, B&N OR GOODREADS. REVIEWS MUST BE HONEST TO COUNT. I’m an avoider, too, Heather – too many people, too noisy, too much annoyance! I stay home on Black Friday. Thank you for the wonderful prize! I no longer shop on Black Friday. I can find deals during the year. I’d rather be at home shopping for books online and blog hopping than be part of the black Friday shopping madness LOL. I follow on twitter, books on GR, blog subscriber, and reviews posted. Thanks for giveaway. I am thankful for all the wonderful books I am finding on the hop! Thanks for the giveaway! Online shopping is really more convenient. I’m also an email follower with the same address. Though I was tempted I didn’t do Black Friday. Black Friday is not for me unless it is online shopping from home:) I subscribe to your blog, follow on twitter( allyson29), I love your books, all are on goodreads with reviews:). I am patienly waiting for your next one to come out:) Happy Holidays! I have friends who go Black Friday shopping but it’s not for me. Thanks for the chance to win! Your book is on my wishlist. I hope to pick it up soon! Thanks for the giveaway! This is the BEST way to spend Black Friday. Sitting at home, hopping with old friends and making new ones. I can’t handle the crowds anymore so I only do Black Friday shopping online if I do any. I tend to pick up gifts throughout the year so come November I’m finished. That way I can spread out the purchasing and not spend a fortune at the time of the year when my job is at its slowest and my paycheck is at its lowest. Thanks for being part of the hop and for the chance to win. I do some Black Friday shopping, but I’m more addicted to Cyber Monday. No lines, No rude people, free shipping…. how can you go wrong! Boo rafflecopter! I actually went out shopping for a bit (at a sane hour, however) and, as I say every year, never again! Way too crowded. Oh, and I’m an email subscriber. Heather, I love your description of what you do on Black Friday. I’m just visiting the other hop hostesses. I do all of my black friday shopping online! You can get the same deals and free shipping! Thanks for participating in the hop! I haven’t done any Black Friday shopping yet – I only left the house this morning to take my daughter and her friends to a movie (Rise of the Guardians was lots of fun!). Thanks for being in the hop! Heather, Great giveaway! I follow you on GFC, I follow on Twitter, and Facebook I think. I did 1-5. I no longer go Black Friday shopping. Too many crazy people out there. I don’t have the patience I had when I was younger, LOL. So today I am staying in and blog hopping, instead of shopping! angadair@nwcable.net Thanks for the hop! 1. I am not shopping. Not for me. Instead of shopping, I’m hopping! I prefer to do my shopping online. I do my shopping online too. Hi! Thanks for such a generous giveaway! Your books sound fantastic. I am already a newsletter follower. A GC would be great, lots of readers in my family we have to label our books. I only do my shopping online. I’m already a twitter follower 🙂 Thanks so much for participating in the blog hop! Thanks for the giveaway opportunities!! I’m an email subscriber. Thanks for the giveaway! Thanks for the giveaway & being part of this awesome hop! I have added your books to my TBRs. Which I will say is growing rather large no thanks to the blogs I visit. As with everyone else can’t do the copter thingy. Follow by emai-ceagles48218@yahoo.com also twitter- @ceagles48218. Thanks for thins chance to win a prize.